It was somewhere around the time that Joan of Arc, having just freed her French soldiers from the mind control of a flying monkey, nonchalantly asked me – Ryu Hyabusa – to travel back in time to save her boyfriend that I decided I was complete on board with what this game had to offer. 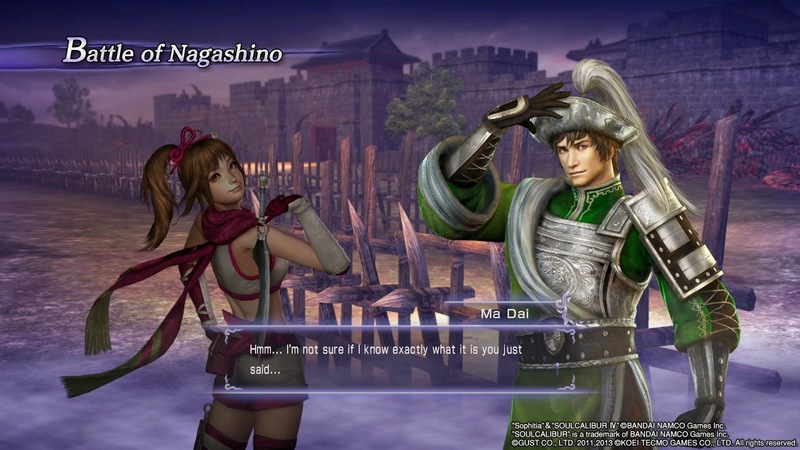 Warriors Orochi 3 embraces the absurd. From the perspective of one who views the Dynasty and Samurai series’ as historical fiction, the Orochi series is the slightly deranged cousin, but deranged in a way that might make it the pinnacle of the Warriors franchise. The Orochi series is set in a parallel universe in which the legendary warriors of the Three Kingdoms and Warring States are thrown together and pitted against the serpent king Orochi and his demon horde. The game opens up with the last ragged remnants of humanity charging headlong into eight jaws of a colossal hydra. Standing no chance, the Mystics send you back through time, to correct humanity’s mistakes during the war, gather an army and create the weapons capable of defeating the hydra. Warriors Orochi 3 Ultimate is a rerelease, the third in fact of Warriors Orochi 3. This game retains much of the content and most characters from the previous editions, whilst adding a host of new characters and several new chapters to the time bending Story Mode, bringing the roster of playable characters up to one hundred and forty five in total. The additional story chapters are shorter than their original counterparts, but they are some of the largest and densest battles in the game. Whether leveraging the new, more powerful hardware, or flexing the development team’s creative muscles, these scenarios are some of the most intense I’ve played, for example; bases may be guarded by four officers rather than one, and at times the enemy reinforcements will literally multiply around you. Such a huge line up of characters illustrates the developer’s (Omega Force) dedication to the ‘wish fulfilment’ aspirations they cited when they launched the series. To achieve the number of characters it does, Ultimate draws from characters outside the two main series, including characters from, Ninja Gaiden, Dead or Alive, Bladestorm : The Hundred Years’ War, Warriors: Legends of Troy, Zill O’ll and more. Troy’s Achilles made some logical sense as Legend of Troy was a Warriors game, I was more sceptical of Ninja Gaiden’s Ryu Hayabusa however, yet he turned out to be one of my most used characters. 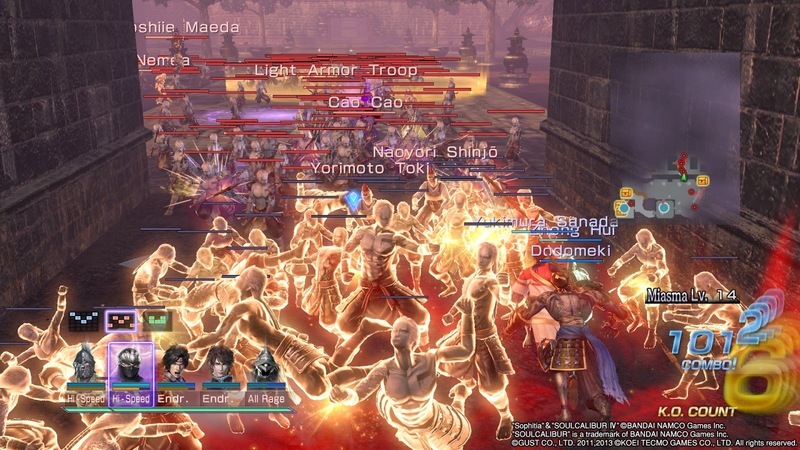 To aid players in seeing all of the characters, Warriors Orochi 3 allows for three characters to be brought to the battlefield at once, and now in Ultimate they are all able to fight simultaneously, controlled as though they were AI bodyguards. However, the true strength of your three chosen warriors is found in the devastating True Triple Attack, which has its own meter. Warriors can also be called in to break up combat – handy if you’re being beaten in a fight and need to stagger the enemy. Such moves lead to quite profound gameplay changes; Ryu’s dashing arcs rapidly cut a swath through the enemy ranks, and Achilles’ powerful blows battered the enemy officers to submission, and when things got too hot, Yukimura Sanada would make a sudden appearance and the three would obliterate literally everything. It is worth noting that this game does not diverge from the Warriors’ divisive button mashing combat or level design. Ultimate introduces some meaningful twists to the gameplay that fans of the series will enjoy, but it makes no attempt to appeal to people who dislike the core gameplay. I don’t consider this a negative – as someone who really enjoys this style of game – but it is worth bearing in mind if you have tried and disliked past titles. Ultimate features a huge amount of content and a lot of ways to see it all. I spent most time with the Story mode; expansive, epic and quite happily crazy. In Free Mode you can replay any battle with any characters, where this differs from Story Mode, is that you can play with other people locally or online. In Duel Mode, which was originally in the Hyper version of the game, warriors fight tag team battles in small arenas, this mode allows for local or online multiplayer. 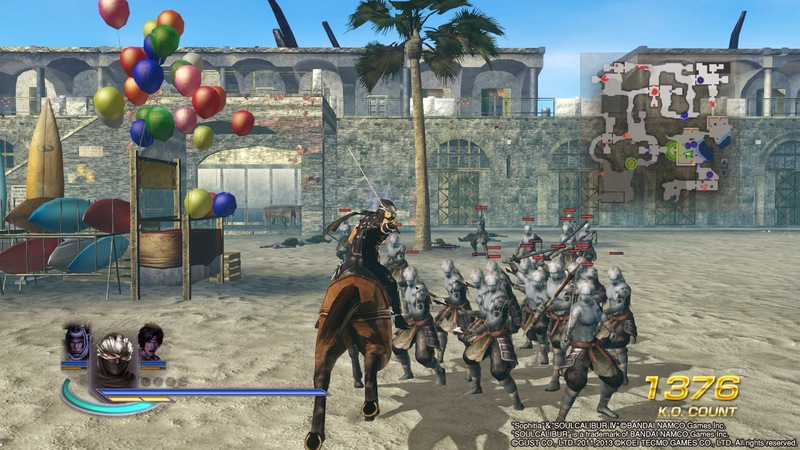 The Musou Battlefield mode allows for missions to be edited, for example, warriors can be swapped out, their dialog changed and special effects added, including; time limits, the composition of troops, the strength of enemies and much more. Players can upload and share their edited missions with the wider community, when I checked this out there was a lot of missions available, but the player reviews were pretty lacking or at least scatter-shot – most had no reviews at all, yet some had several dozen. New to Ultimate, Gauntlet Mode will have you leading a five strong team through a series miasma covered stages, speed is of the essence as the more you kill the harder the enemy becomes – and there is a lot of enemies. It’s an interesting twist that had me pushing myself to move with greater urgency, even though there was no actual pressing time limit. 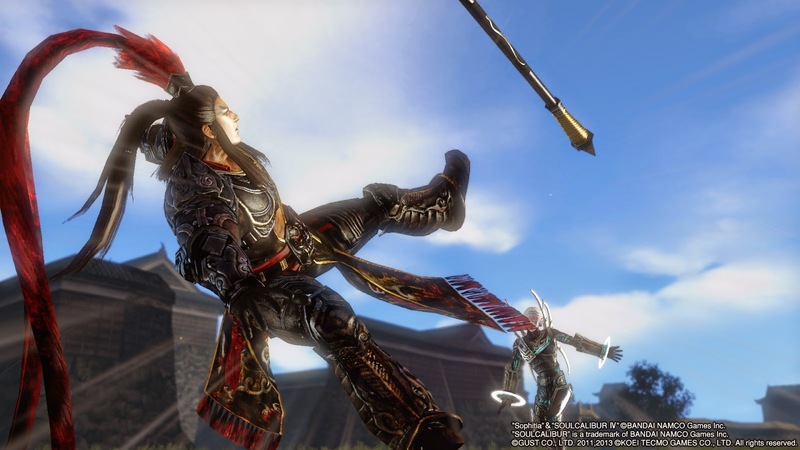 There are times when Warriors Orochi 3 Ultimate lacks the visual detail and polish of its cousin, Dynasty Warriors 8 Xtreme Legends, which was released earlier this year. 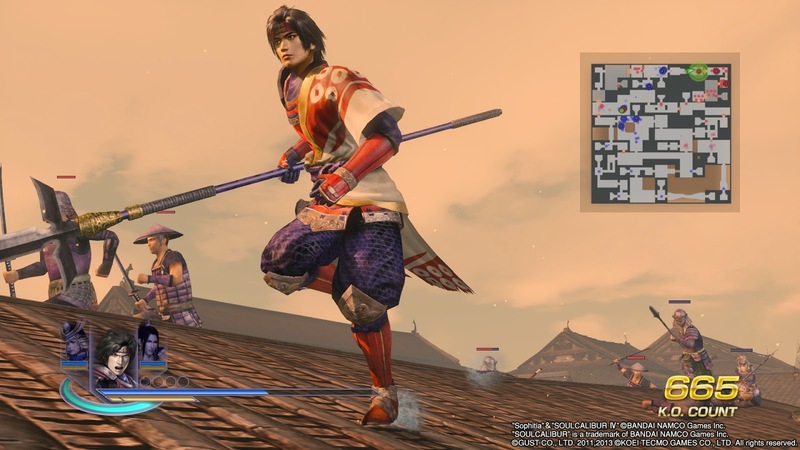 Some character models and environments look a little grimy in comparison, not totally surprising as this game uses some older character models, for example, from the Dynasty Warriors 7 series, not 8. Alas, such occurrences are fleeting, masked by the explosive effects and shear number of models on screen and can only really be noticed in Story Modes's cutscenes. It certainly looks sharp, but it is clear that increasing the enemy count was the greater focus, Ultimate boasts a further one hundred and fifty soldiers on screen. I’ll be honest, I didn’t count, but the effect is abundantly obvious. Rather than just the two or three meters around your character being filled with the enemy hordes, they extend much further, enemies tend to move into view rather than appear out of thin air. The Ultimate soundtrack is an eclectic assortment of the expected electric guitar riffs, some (mildly) more oriental sounding strings, with a healthy dose of pop. It fits the tone of the game perfectly; the bizarre medley of music echoes the ludicrous cast of characters and nonsensical narrative that drives them together. The voice acting remains in Japanese, which was probably a sound move as it deftly avoids the bad pronunciations that have accompanied the English voice acting in the series’ past. Warriors Orochi 3 Ultimate is a huge game, packed full of characters and content across a host of different game modes, and of course, the ferocity of the battles is made all the greater by the power of the new consoles and the huge number of enemies they allow for. Ultimate is a joy; from the absurd time travelling premise, to the odd relationships between characters who should never have met . Of course, there is probably nothing here for people who know they dislike Warriors games – the gameplay, level design and even the bizarre soundtrack will all feel familiar and excellent to fans of the various series’. Looking sharp and sound great, Ultimate is an excellent version of Warriors Orochi 3, the additional content, characters and modes make this perhaps the biggest and most diverse Warriors game I can recall playing.